The Indonesia-UK DIKTI Scholarship Programme is available to lecturers in Indonesia who would like to undertake their doctoral studies at UK universities and higher education institutions. 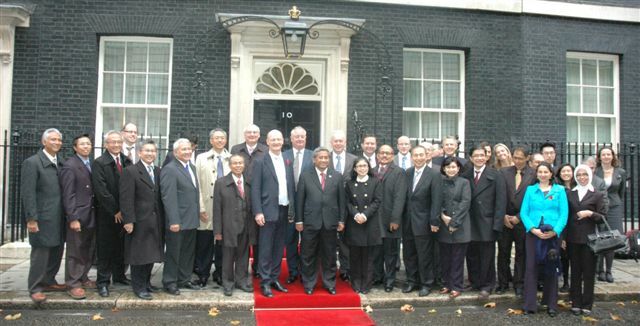 Indonesian delegation at Number 10 Downing Street after signing the MoU for the Indonesia-UK DIKTI Scholarship Programme including Prof. Mohammad Nuh (Indonesian Minister of Education & Culture), Prof. Djoko Santoso (Director General of Higher Education, DIKTI), Rt. Hon. David Willetts MP (UK Minister for Universities & Science) and Prof. Eric Thomas (President, Universities UK). There are 750 scholarships available over the next 5 years for permanent or prospective faculty members at Indonesian universities and administrative staff employed by DIKTI or Indonesian state universities. The scholarships will cover three years of PhD study fully funded by the Indonesian government including tuition fees, accommodation and stipend. All academic disciplines and research areas will be funded under the programme and researchers can apply to any participating higher education institutions. Scholarships will mainly be granted for PhD study but some Master’s degrees may also be funded. The first scholarships will be available for September 2013.